Roaming the Roads, Strolling the Streets, Plodding the Pontes – Run. Ride. Roam. 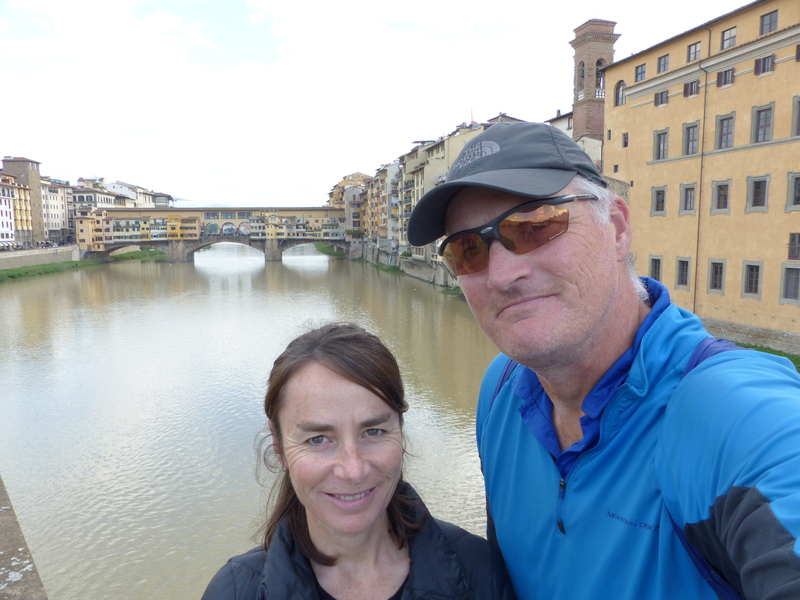 Today we had planned to take the bikes out for a spin, to visit a garden on the edge of the city for a picnic and then take in the views of Firenze from the Piazzale Michelangelo, but the rain put a stop to those plans! So, none of those things happened. But…we were supposed to checkout tomorrow, ride on and leave Florence behind, but we’ve decided to stay on for a few more days, so today’s plan can still be postponed for another day. The joys of freedom and flexibility! 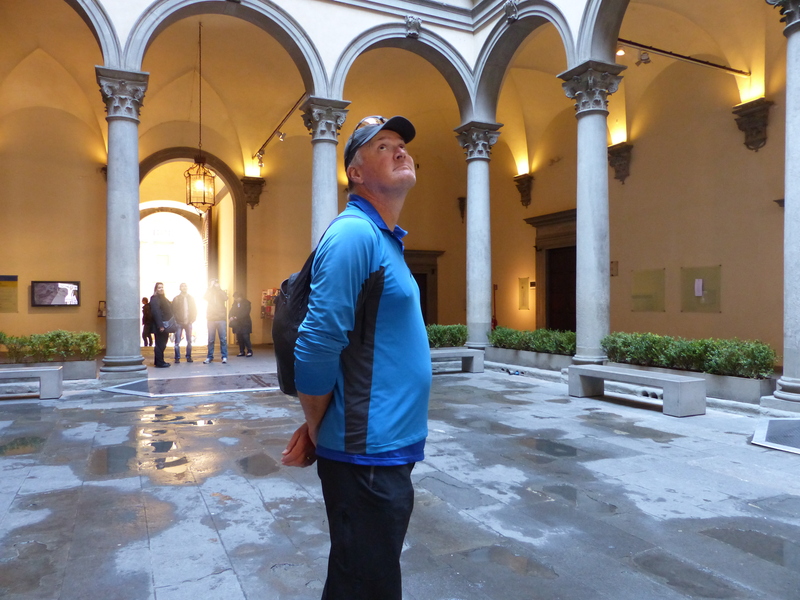 With the bikes still resting in their little courtyard, be opened our umbrellas and set off to continue our explorations of Firenze. Of course, as we began walking towards the city centre, the rain stopped and the sun came out! We could have been picnicking after all. Oh well, this fickle weather will thwart our plans and confuse us whenever it can, I guess. We forged our way through the crowds at the markets, smiling but ignoring the stall holders’ attempts to get our attention and make a sale. When we reached the centre of the city, we just strolled where our feet took us, with no particular direction or destination in mind. 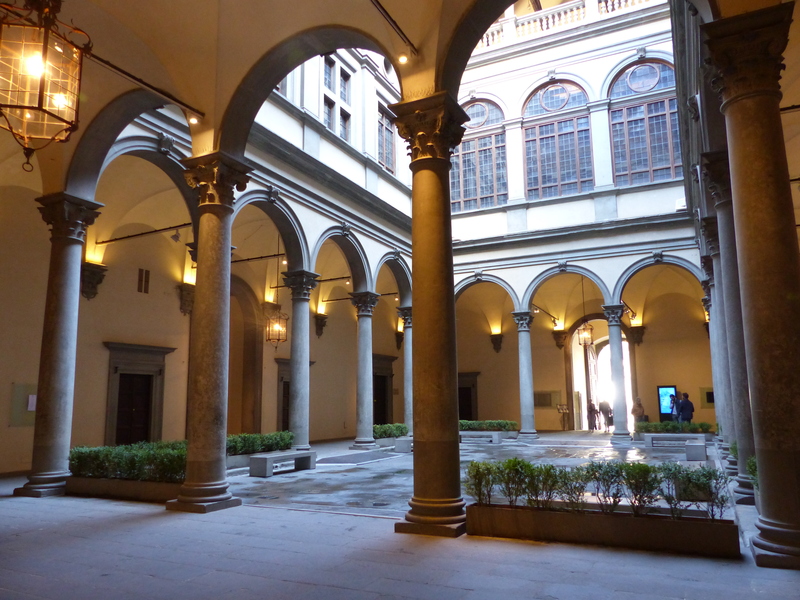 We came across Palazzo Strozzi, which was a beautiful place. 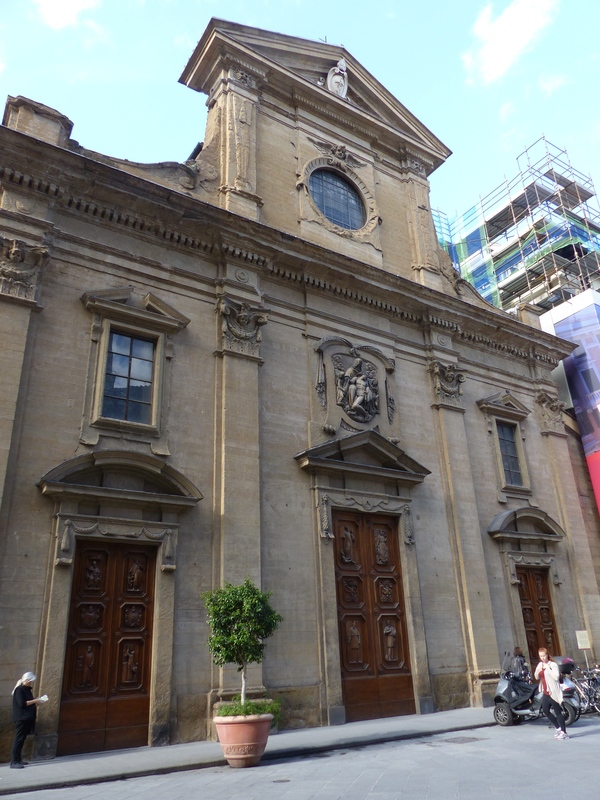 It began its life in 1489 and is an example of Renaissance domestic architecture, having been commissioned as a home for the Strozzi family. The internal courtyard was such a lovely place, so peaceful in such a busy city. I loved it there. We look up, down and all around! Then the streets just led us this way and that, down tiny lane ways, along cobbled streets, over bridges and we roamed, gazed and spent as much time with our heads up and eyes skyward at the buildings, as we did eyes front, looking where we were going. 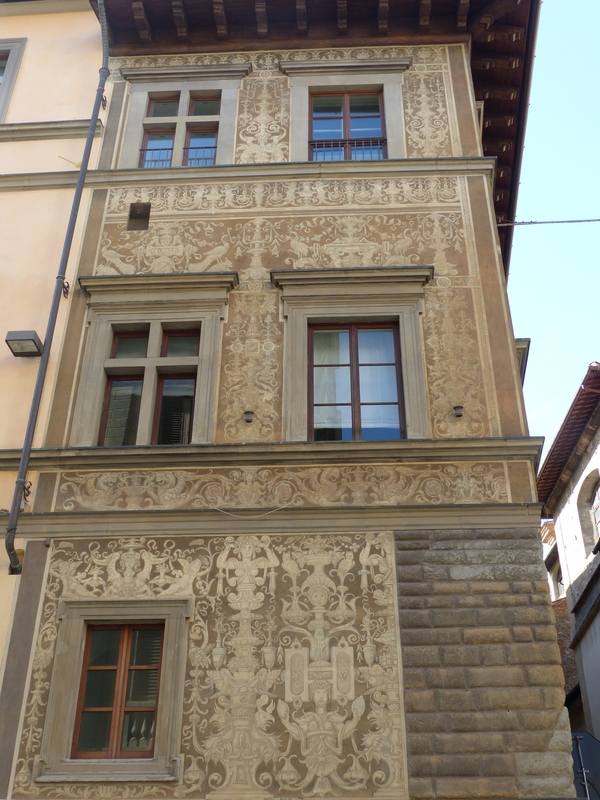 We were amazed to read some plaques on the walls that told us the streets were from the 13th, 14th and 15th centuries. 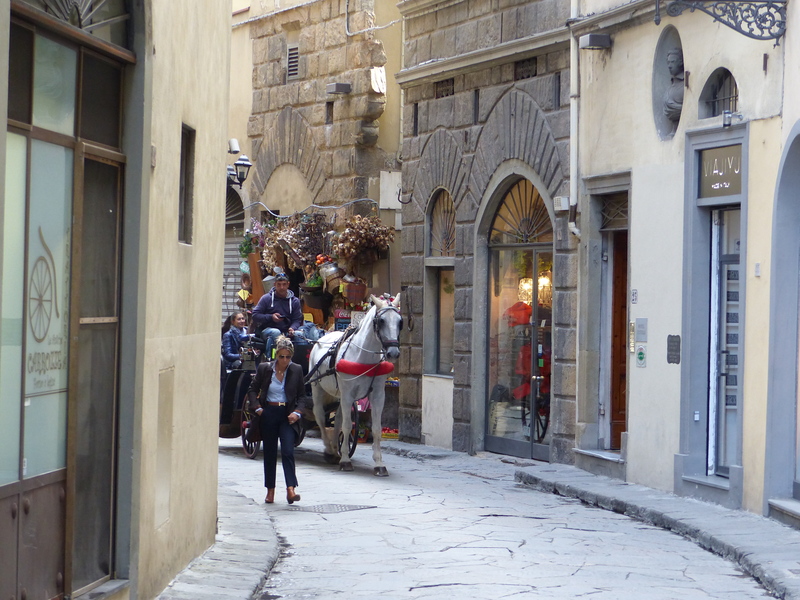 We were walking along streets and lanes that were 700 years old. Just mind boggling! 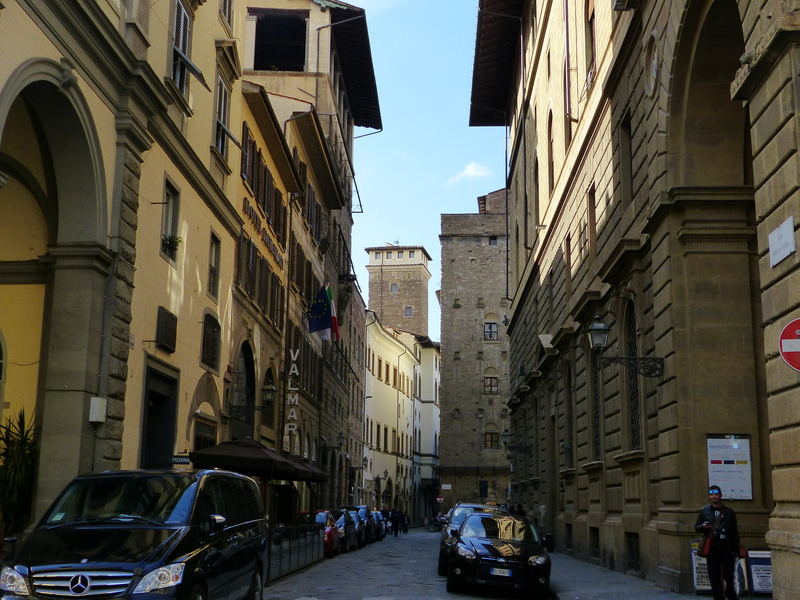 We really like Florence and it still feels a lot like Paris, even the colour palette is the same, with the buildings sitting alongside each other in different shades of brown. There’s the occasional building of yellow, or a different colour, but it’s a pretty monochromatic city and, like Paris, it works beautifully in colour and design. 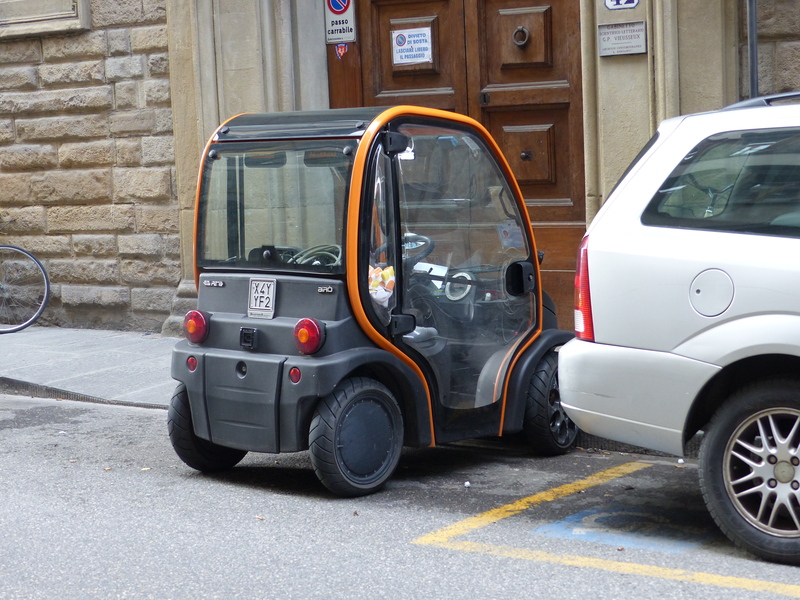 When you drive a car the size of a roller skate you can park anywhere! 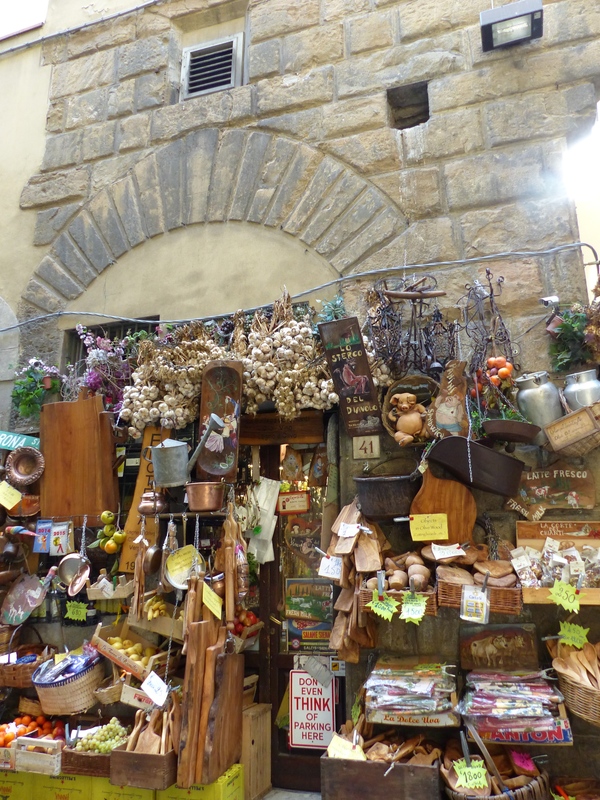 I loved a little shop we saw, with its goods hanging from the walls outside. It was down a tiny backstreet, tucked away from the crowds and tourists and I stood for ages, looking at the various items on display. I plan to go back and take the time to look inside, which was tiny and crammed with things, all looking beautifully rustic and authentic, hanging from every possible space. 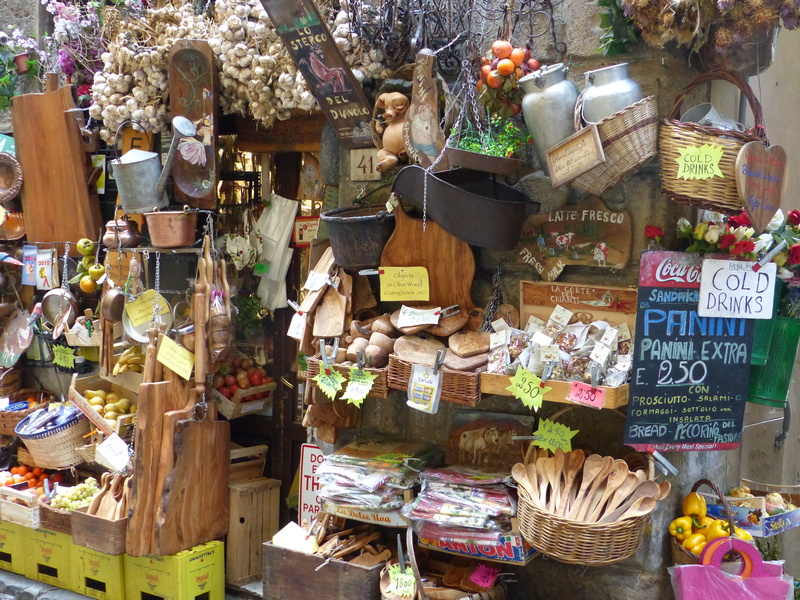 I love places like that, hidden away, with “real” goods for sale, rather than the tourist tat. Not that I can buy anything, with space and weight being paramount concerns with our mode of travel, but I’ll enjoy looking! 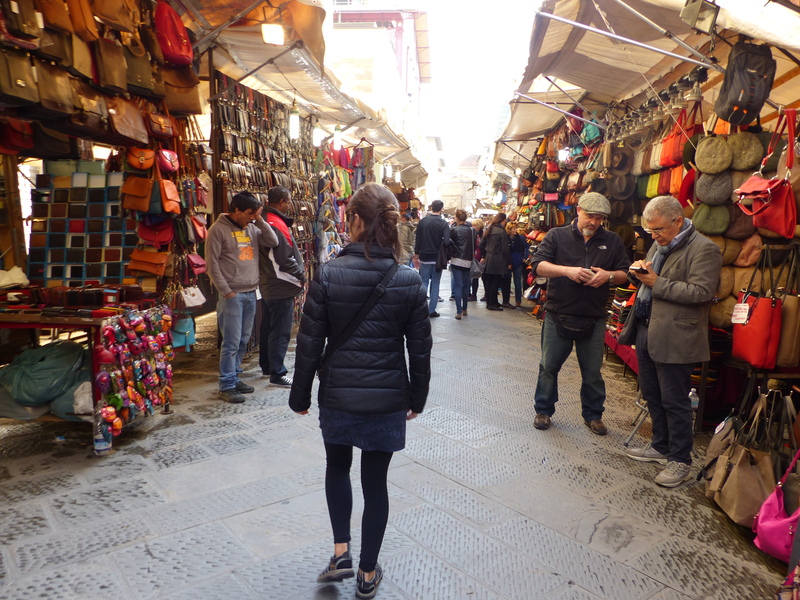 We found ourselves back on the Ponte Vecchio, so we weaved our way through the masses, crossed over the river before wandering the streets and then crossing back again. We stopped on another ponte and again had to politely decline the offers of bargains from the many hawkers whose patch was the bridge. No luck today hawking to the Tassies! The trouser legs must be skinny and must be worn rolled up above the ankle. For the full fashionable effect, the ankle must be visible and socks should be left at home. Wear your hair thick and with enough product to look tousled and ever so slightly windblown, while maintaining an appearance of intentional bed-head. A man bag is essential. Don’t leave home without your handbag sized bag for men. This is a must-have accessory and no fella worth a pinch of style would be seen in the street without his man bag over his shoulder. The ensemble should be monochromatic. Choose a colour and then complete the look with a variety of shades of that colour. If wearing brown trousers, choose other items in beige, fawn or stone. If you have an item to wear that is grey, pair it with other items that are charcoal, slate or oyster. You may choose fifty shades of grey if you feel so inclined. Bright or contrasting colours should be avoided. We don’t want a clash, we want a subtle coordination and meeting of minds, between the shades being worn. Heels should be skyscraper high or flat, nothing in between. All shoes should be either flat, such as a ballet pump or a sneaker, or a surgery-inducing stiletto, but a mid-heel should not be worn. The only exception to this, is if a boot is being worn, in which case a mid-height heel is permissable. The velour jumpsuit that has been sitting in the cupboard, keeping the mothball industry afloat since 1974, is now quite acceptable as an item of street wear. It is a perfectly legitimate fashion item on the Italian street, as long as you have a figure that would see you accepted as one of Charlie’s Angels. So there you have it. Follow those simple fashion rules of thumb and you will be good to go as a style icon on the streets of Italy! After many hours of roaming we returned to our little apartment and I made use of the novelty of a kitchen again and cooked us up a very filling shepherd’s pie. We had another great day. 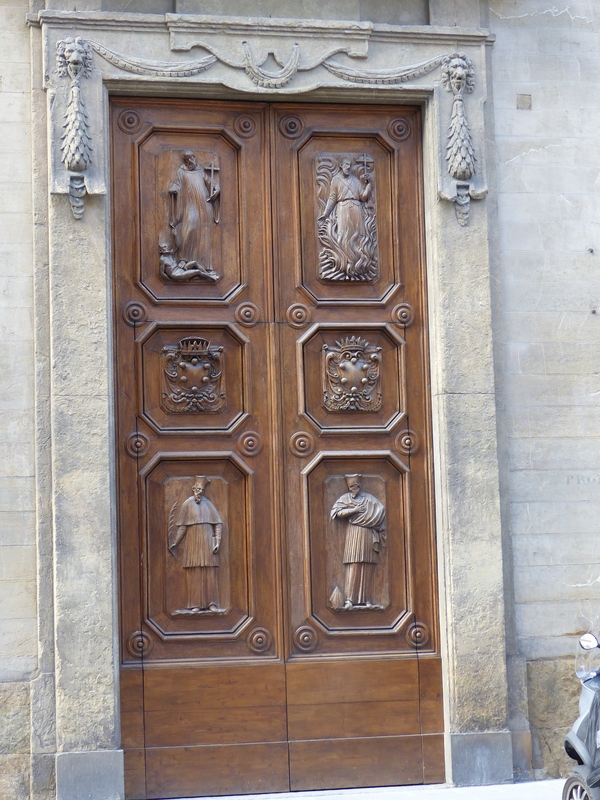 An easy day, exploring the streets and roaming down the narrow hidden lane ways, away from the crowds. We found ourselves saying to each other again, “I like Florence.” It really is a lovely city, so much to see, just roaming. We love just getting to know a place, by just immersing ourselves in it and that’s what we did today. No destination. No definite roaming plans. No itinerary. Just being here. Just “being”. Everything we do, everything we see is an experience and a moment to be savoured. Everything is new, so everything is memorable. We stumble upon things and always manage to find things that are interesting, beautiful or intriguing. It’s our own “serendipitous style” of travel!